Bobby Benser and Carnel poured the first batch last week of our newest flavor – Michigan Honey Butter. 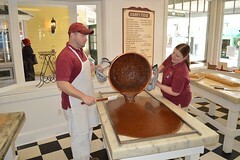 It’s now available at our three Mackinac Island, Michigan fudge shops. Happy Summer Solstice! Kevin is ready to take you and your friends out on stand up paddleboards. http://MackinacKayak.com for reservations. Good morning from beautiful Mackinac Island. Don’t we have the most spectacular sunrises? 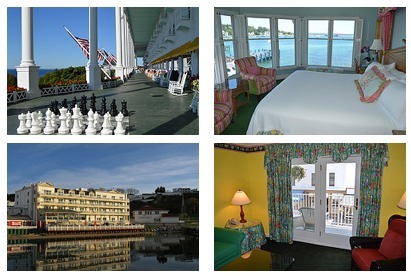 The deck on the grounds of Lakebluff Condos & Suites on Mackinac Island. Stunning views of the Straits of Mackinac and the Mackinac Bridge. Sneek peek….the Clydesdales are on their way to the parade starting point. The lilacs in Marquette Park this afternoon. Have you made it to the island to see the lilacs yet? They have arrived just in time for the Mackinac Island Lilac Festival! Such a welcome sight & smell! Come hang with us. Beautiful flower baskets went up this week all around downtown Mackinac Island. Grand Hotel History Lecture with Hotel Historian Bob Tagatz. An early blooming lilac tree near the marina with the Harbor Light and Round Island Lighthouse in the distance. We are looking forward to our upcoming Mackinac Island Lilac Festival. (June 6th to June 15th) Photographed these this afternoon…..getting ready to bloom. Tulips at the Inn on Mackinac. Bright and cheery after a rainy start to the day. A Mackinac Island Wedding on the grounds of The Inn at Stonecliffe with the Mackinac Bridge on the horizon! On June one our last snow pile is hanging on amid the sunshine and spring flowers! Today’s beautiful sunrise on Mackinac, near Mission Point Resort. It is a perfect day for a round of golf! Where else do you get a horse-drawn carriage ride to the back nine?